Sent to my adult son as a gift. His response was sweet. High praise indeed. he Winchester 44 Elite is a fascinating timepiece from Stuhrling.It has an incredible skeletonized spoke-style dial that is poweredby an automatic movement. The timepiece is a equipped with astainless steel link bracelet. Most men's watch bands can be sized to fit 7.5-inch to 8.5-inchwrists. I bought this watch in the black color option for my husband as an Anniversary gift. It is a really beautiful watch. The blue hands are really unique and striking. It’s a very stylish watch and looks like to cost a lot more than I paid. He’s thrilled with it and hasn’t taken in off since he got it! My husband gets so many compliments on this watch. Ordered in black stainless. The blue really pops. Fashionable, affordable, fast shipping. Would definitely consider another watch from this company. Bought this watch in April 2018, it's September 21, 2018 and it just decided to freeze up and completely stop working. I'm not very happy about this. Not sure what my options are, but I don't feel like waiting 20 minutes to talk to a customer service rep that will probably tell me to screw myself. I wouldn't recommend this watch to anyone. It looks like an expensive watch, but looks obviously can be deceiving. I bought this as a gift and it came in an impressive box with all the authentication documents. He was blown away and I was so happy that it was even better than what I expected. 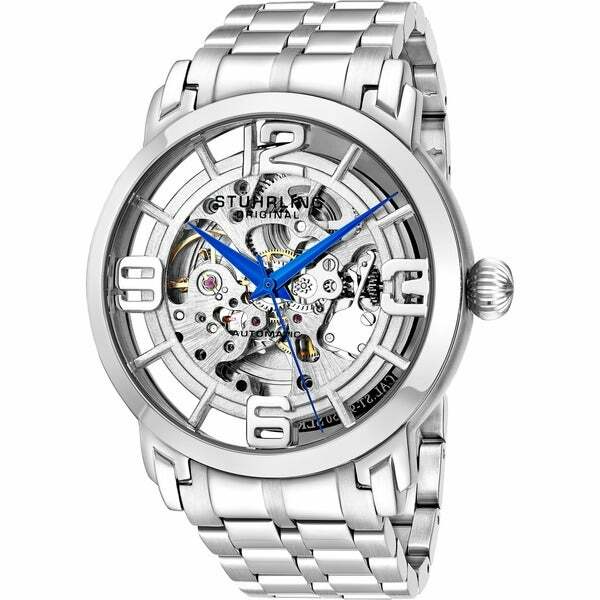 The quality of the watch was very good and the it looked even better than the pictures on overstock. I purchased this watch as a gift and am very pleased with the quality. My wife and I have purchased several watches hear and for the most part have always been pleased. Got this as a gift for my husband. It is beautiful! He loves it and continues to get many compliments about this watch when he wears it. It is very well made. We love this brand and my husband needed a gold watch.